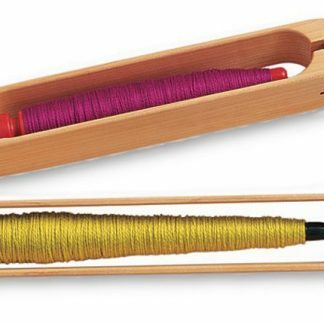 Schacht End-Delivery Shuttles are the ultimate in shuttles designed specifically for handweavers. They are lightweight and comfortable in the hand, adjustable to a variety of yarns, and simple to thread. It’s dimensions are 15″ by 1 5/8″ by 1 1/4″. The 15″ End-delivery shuttle uses 8″ pirns – instead of bobbins – sold in bags of 5.